Damage Meter Graph (last 100 fights). Note: Click the graph region to reset. 1. Extract the contents of the archive into Data\Gui\Customized. 2. If CharPrefs.xml exists: Copy the lines below into the CharPrefs.xml file (between the <root></root> nodes). Otherwise rename the provide file to CharPrefs.xml. 3. If Modules.xml exists: Copy the lines below into the Modules.xml file (between the <root></root> nodes). flags = "GMF_CFG_STORE_USER_CONFIG | GMF_DONT_UNLOAD"
criteria = "CombatFactory &amp;&amp; (guimode &amp; (GUIMODEFLAGS_INPLAY | GUIMODEFLAGS_ENABLEALLGUI))"
Otherwise rename the provide file to Modules.xml. 4. Copy the CombatFactory.swf file into the Data\Gui\Default\Flash directory. 5. Launch The Secret World. 1. Remove the added lines from the CharPrefs.xml and Modules.xml. 2. Delete CombatFactory.swf from the Flash folder. -Tracker now moves independently to other windows. Why does your Modules.xml file have the information for Viper's top bar in it? An error on my behalf. The modules.xml.bak was overridden by the patcher. With the movable version I cannot type into some text fields. Focus is immediately lost. For example Renaming a bag, or saving a skill set with deck manager. Tried with no mods installed except CombatFactory. Gong to have to chime in on this latest bug as well. Pulling the mod out allowed me to be able to type in input fields again. For some reason, having CombatFactory installed causes those fields to lose focus, making it rather difficult to do missions with the G-H-O-S-T interface. It also effects other addon's input fields as well, such as Viper's deck manager. Flash I've discovered is a fickle thing. The idea of hit testing for the mouse hovering over is pretty common, and something that most GUI controllers handle for you. However the releasing of focus is new. Never thought the actual modules would take complete control even when the mouse is no where near it. Last edited by : 07-29-2012 at 04:32 PM. The only way out, is through. Just wanted to pop in and say the new version is very attractive. Amazing work! Edit: And also, a bug report. Apparently when opening the bug report function for the game, your addon 'sticks' to it. 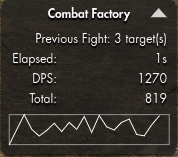 As in, if I drag and move around the bug report window, the combat factory window will drag with it. Edit2: Actually, it sticks to any floating window. I tried moving another mod's window as well as a default inventory window, and combat factory moved around with it as well. I must admit that made me smile. I'll fix and release tomorrow morning. Last edited by : 07-27-2012 at 05:11 AM. If I may make one minor suggestion for when you have the time: check to make sure your hidden button triggering the slide is above the layer with the text/content so that the slide will always trigger when the mod is clicked. It is kind of annoying not being capable of clicking the text (which is logical). I'll add it to the list for next release. The dragging feature would be much appreciated, too, as right now it interferes with my chatbox. Seems to work for me when I modify the default loginprefs and modules xmls. I just commented it at the bottom like so <!-- MODS --> and put it the entries there. Might want to watch the patcher also. If you see it dling something, you know it's overwriting your changes. Question though, I'm not sure how to drag this as attempting to drag it around doesn't seem to work for me. Am I missing something? Also, awesome job. Dragging is not possible yet. It's on my to-do for tonight. Last edited by arandomguy01 : 07-18-2012 at 01:23 PM. I can't get this one to work. Maybe a clash with vipers deck manager?